On Wednesday April 17, NYU Washington, DC and the National Democratic Institute (NDI) will co-sponsor an evening Salon Series conversation featuring Ann Mei Chang, Author of, LEAN IMPACT: How to Innovate for Radically Greater Social Good. Ann Mei also serves as Executive Director of LEAN IMPACT. 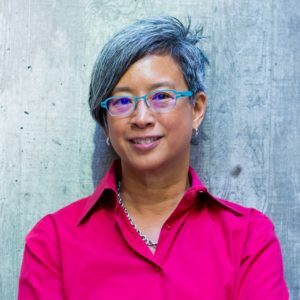 Ann Mei Chang is a leading advocate for social innovation. As Chief Innovation Officer at USAID, Ann Mei served as the first Executive Director of the US Global Development Lab, engaging the best practices for innovation from Silicon Valley to accelerate the impact and scale of solutions to the world’s most intractable challenges. She was previously the Chief Innovation Officer at Mercy Corps and served the US Department of State as Senior Advisor for Women and Technology in the Secretary’s Office of Global Women’s Issues. Around the world, a new generation is looking beyond greater profits, for meaningful purpose. But, unlike business, few social interventions have achieved significant impact at scale. Inspired by the modern innovation practices popularized by bestseller The Lean Startup that have fueled technology breakthroughs touching every aspect of life, LEAN IMPACT turns one’s attention to a new goal–achieving radically greater social good. Social change is far more complicated than building a new app. It requires more listening, more care, and more stakeholders. To make a lasting difference, solutions must be embraced by beneficiaries, address root causes, and include an engine that can accelerate growth to reach the scale of the needs. LEAN IMPACT offers bold ideas to reach audacious goals through customer insight, rapid experimentation and iteration, and a relentless pursuit of impact. On April 1, NYU Paris hosted an event featuring one of its professors, Valérie Berty. Professor Berty presented her book Sembène Ousmane (1923-2007): Un homme debout. 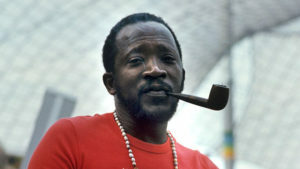 Sembène Ousmane was a Senegalese film director, producer and writer. He was considered one of the greatest authors of Africa and he has often been called the “father of African film”. The program also included a screening of Sembène Ousmane’s first movie Borom Sarret (18mn) introduced by journalist and African cinema specialist Catherine Ruelle and by Alain Sembène. After the screening there was a panel discussion with Valérie Berty moderated by Elisabeth Molkou (New York University Paris) with Marc Cerisuelo (Université Paris-Est Marne-la-Vallée) and Boniface Mongo-Mboussa (writer and literary critic). It was a lively and informative evening. On April 10, NYU Florence will host a dialogue with Dario Miccoli, Lecturer of Modern Hebrew and Jewish Studies, Ca’ Foscari University of Venice. When thinking about the Holocaust, almost everyone refers to the Jews of Europe and, particularly, countries like Poland, writers like Primo Levi, and places like Auschwitz. Few people remember that the Jews of North Africa also experienced the Second World War and, in some cases, the Holocaust: think of the Jews of Algiers subject to Vichy’s anti-Semitic legislation, or the Libyan Jews deported to Bergen-Belsen in 1944. Even though the situations of the Jews of Europe and North Africa during the war can hardly be compared, over the last few years a number of Jews of North African origin now living in Israel or Europe have started to discuss the idea of a ‘North African Holocaust’ through literature, movies and in spaces such as museums and heritage centers. Focusing on the work of Italian, Israeli and French writers and artists of North African Jewish origin, Miccoli will investigate the emergence of the idea of a ‘North African Holocaust’, asking to what extent this constitutes the rediscovery of hitherto little-known memories, or something that largely bespeaks contemporary societal and political agendas in the context of today’s Europe and Israel. Special emphasis will be placed on the case of Libya under Italian rule, the vicissitudes of the Libyan Jews during the Second World War, and the impact of the Holocaust on the memorialisation processes put forward by Jews of Libyan origin – from the writer Victor Magiar to the heritage activist David Gerbi – living in contemporary Italy. 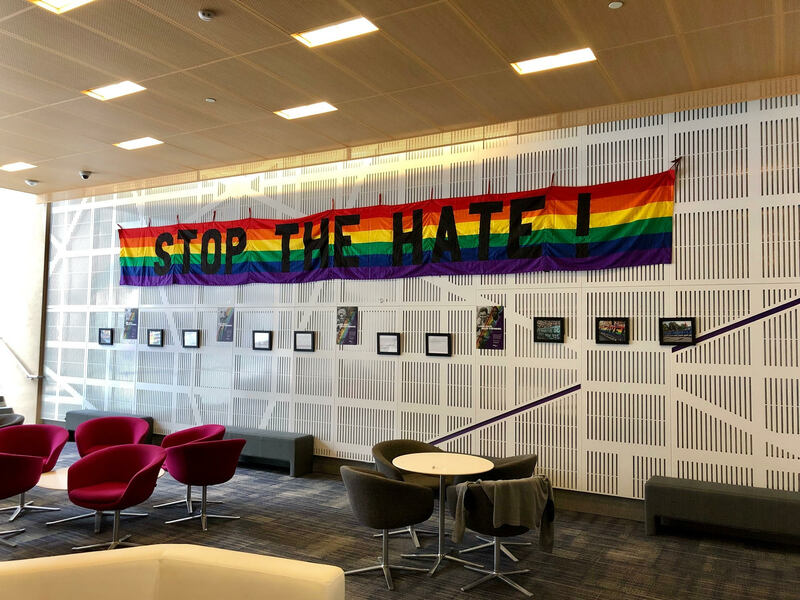 The Stonewall 50 commemoration at NYU Washington, DC, as part of New York University’s larger Stonewall 50 celebration, is displaying a protest banner created by flag designer Gilbert Baker. The banner has been used in rallies in New York City where it was carried by activists advocating for LGBTQ rights. In 1978, Gilbert was tasked with creating a flag at the request of Harvey Milk for a gay pride event. His creation of the rainbow flag would become a worldwide symbol, forever cementing his place and importance in helping to define the modern LGBTQ movement. 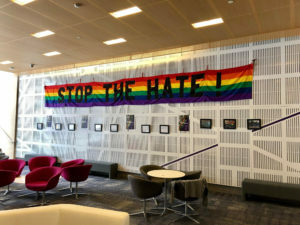 STOP THE HATE is a protest banner measuring fifty feet wide (the approximate measure of the width of Manhattan’s Fifth Avenue), and has been used in Pride Marches and protest demonstrations in New York, Los Angeles, and Washington, D.C. Over the years, Gilbert created several such banners on the same scale, including ones emblazoned with DIGNITY (for the LGBTQ Catholic organization), GAYS AGAINST GUNS (for the New York City group of the same name that was formed in the wake of the Pulse nightclub massacre in Orlando, Florida in 2016), RISE AND RESIST, and DON’T BUY PUTIN’S LIES (which Gilbert and members of the activist group Queer Nation arranged to be secretly shipped to Moscow and displayed in the wake of Russian ‘ anti-gay propaganda’ laws at events leading up to the 2014 Sochi Olympics).STOP THE HATE and many of these other banners were proudly carried in a march from New York’s Stonewall Inn to the Christopher Street Piers after Gilbert’s wake after his untimely death on March 31, 2017. In the decade since the Global Financial Crisis, Australia’s engagement with the People’s Republic of China has continued to expand and while the commercial relationship is complimentary and robust, public discourse regarding political interference and security concerns continue to run counter to this unfettered optimism. The Australian public has more recently been exposed to headlines regarding visa cancellations for academics attempting to complete field research in Xinjiang; concerns of scientific collaboration being too obscure and leading to gains for Beijing’s opaque security apparatus; and the detainment of Chongyu Feng, Associate Professor of Chinese Studies at the University of Technology Sydney (UTS). 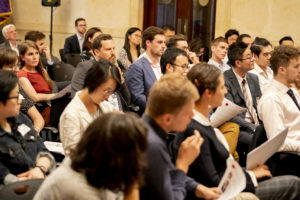 China Matters is a local think tank, established to stimulate a realistic and nuanced discussion of the PRC among Australian business, government and the security establishment, and to advance sound policy. Part of the organization’s efforts rest in bringing young professionals into the discussion. Each year, China Matters hosts youth policy forums, debates, and publishes articles from young China watchers. 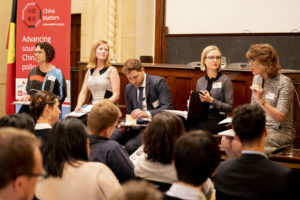 On December 5, 2018, NYU Sydney collaborated with China Matters by hosting the 6th debate in the series. 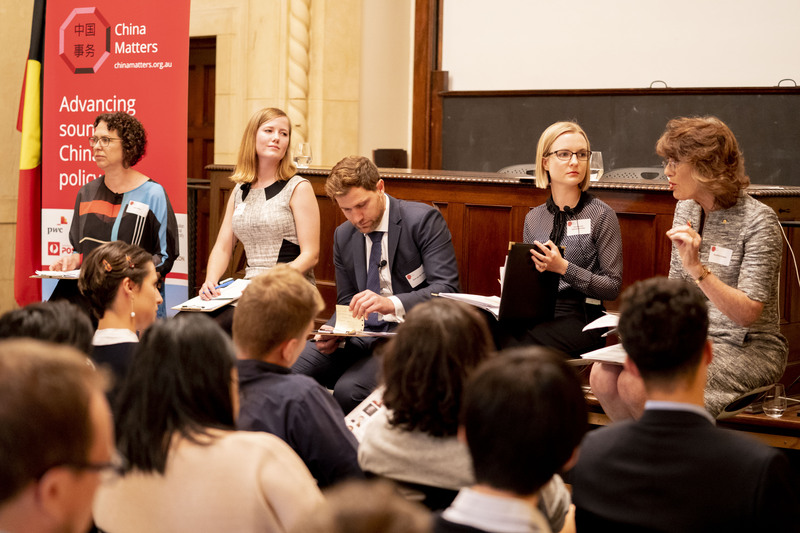 These debates bring together two young professionals and two special guests to debate topics that are key to the Australia-China relationship. The format is geared at providing stimulating discussion that spans generations, levels of experience, backgrounds and competencies. The two special guest debaters for the evening were Dr Jane Golley, Acting Director, Australian Centre on China in the World, ANU, and Ms Geraldine Doogue AO, ABC Broadcaster. The young professionals participants were Ms Simone van Nieuwenhuizen, Project and Research Officer, Australia-China Relations Institute, and Ms Belinda McEniery, Health Economics Associate, Johnson & Johnson. The debate was moderated by Mr Dirk Van der Kley, PhD Candidate, ANU. The debate started strong with Dr. Golley insisting that anecdote and statistics play a key role in separating fact from fiction. Golley revealed five separate instances in detail regarding visa and book publication deal cancellations, and anecdotes of joint collaboration for publication in journals whereby content had been altered in the editing process in order to reach publishers’ requests for a softer tone. The punchline– they were all personal anecdotes. Simone van Nieuwenhuizen from the Australia-China Relations Institute at UTS did well to rebut these points while simultaneously bringing to light more factual recounts regarding media stories of detained academics from her own institution. At the heart of her argument for the negative team was her insistence that there was no real threat, the academic relationship is strong and the media have led to a misrepresentation of relations. Belinda McEniery, Health Economics Associate, Johnson & Johnson then discussed the topic from an economic and policy perspective, arguing that the PRC has so many policy levers that simply leave Australia too vulnerable. McEniery spoke more broadly of political interference citing recent cases in Federal politics to exhibit the breadth of the issue. The final speaker was one of Australia’s most loved journalists, Ms Geraldine Doogue AO, ABC Broadcaster. Doogue again attempted to argue that public opinion had been too heavily tainted by media headlines. 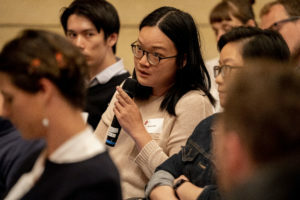 Doogue spoke of the impact of these developments on Chinese students studying in Australia, and argued that there are deeper aspects to the story that need more attention. She again rebutted the affirmative team by assuring the audience that our institutions are more robust than we might think. And this, she closed with, is the most important thing to remember when we are considering threats. Threats are only threats when we fail to mitigate them. The event concluded with a robust Q&A where members of the audience were able to interact with the panel, seeking their expertise on the topics discussed. Once all questions had been fielded, the moderator, Louisa Bochner of China Matters asked the audience to vote for the winning team. The affirmative team of Dr Jane Golley and Belinda McEniery won with a count of 44-32. After the event the crowd broke out into NYU Sydney’s Edgeworth David room for catering and refreshments. Sydney students and guests were able to talk to the panel one-to-one to discuss the debate in more detail. NYU Sydney was also proud to host John McCarthy, Senior Advisor to Mitsubishi Materials Corporation in Tokyo, and the Chair of the Advisory Board of the Griffith Asia Institute; Stephen FitzGerald, adviser to former Prime Minister Gough Whitlam, and Australia’s first ambassador to the People’s Republic of China; Jocelyn Chey, founding Director of the Australia-China Institute for Arts and Culture, Western Sydney University 2016-17; and Laurie Smith, member of the national board of the Australia China Business Council and Executive Director of International at Austrade 2011-2015. 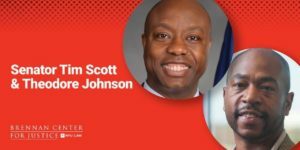 On Wednesday, March 27, NYU Washington DC is hosting an event with Senator Tim Scott in conversation with Theodor Johnson. Senator Tim Scott of South Carolina continues to forge a singular path in D.C. as the Senate’s only black Republican serving at a time marked by unprecedented levels of political polarization. 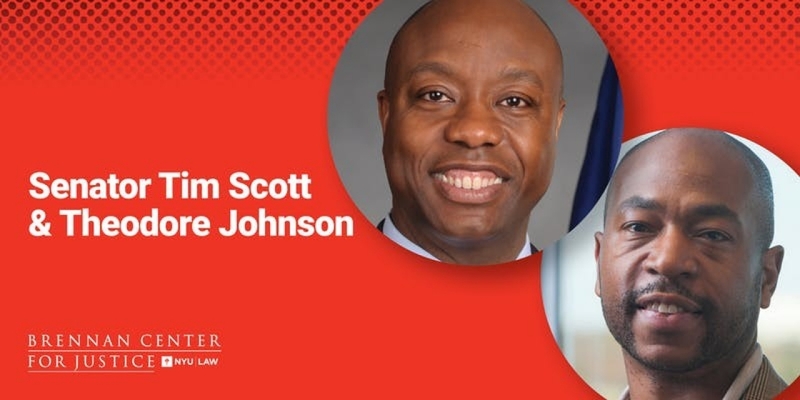 Widely lauded for spearheading a cross-party effort to include a provision encouraging private investment in distressed communities into the sweeping 2018 tax overhaul, Scott joins Brennan Center’s Theodore Johnson to discuss his unique views on bipartisanship, racial justice, and advancing economic opportunity for all Americans. The John Brademas Center of New York University is proud to co-host this event with the Brennan Center for Justice. 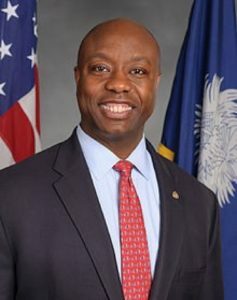 As a leader on tax reform, education and job training, and innovative ideas to reinvest in our nation’s distressed communities, United States Senator Tim Scott brings a unique perspective to the United States Senate. Growing up mired in poverty in a single parent household, Tim says that he is living his mother’s American Dream, and through his Opportunity Agenda works every single day to ensure every American family has the opportunity to succeed. 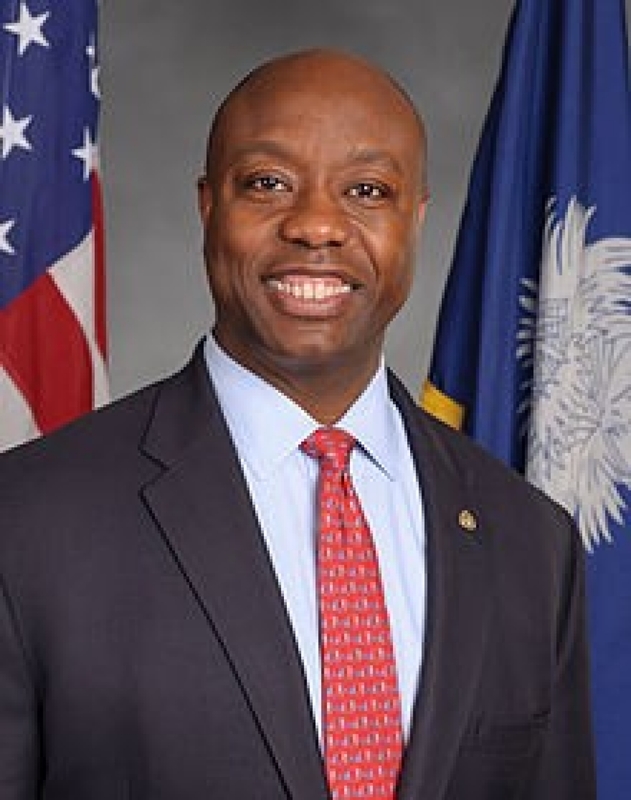 Senator Scott has served the great state of South Carolina in the U.S. Senate since 2013, and brings with him a mission to positively affect the lives of a billion people with the message of hope and opportunity. Growing up poor in a single-parent household in North Charleston, South Carolina, Tim watched his single mother work 16-hour days as a nurse’s assistant to keep him and his brother afloat. As a freshman in high school, Tim nearly failed out, flunking four classes. However, the next year, he met his mentor named John Moniz who shared life-changing ideas and the basic principles of business with Tim. Through hard work, education, innovation, and with the discipline his mother gave him, he began the process of turning his life around. The lessons gleaned from his mentor still guide Tim today: you can think your way out of poverty, and financial independence is a stepping-stone for success. Having a job is a good thing, but creating jobs is a great thing. An unbridled optimist, Tim believes that despite our current challenges, our nation’s brightest days are ahead of us. During his time in office, he has been a tireless advocate for creating more opportunities for families living paycheck-to-paycheck and helping children who are mired in poverty have access to quality education. He launched his Opportunity Agenda, a legislative package aimed at achieving these goals, as well as the Senate Opportunity Coalition, a group of Senators committed to helping those in need. Tim also knows that in order for our nation to prosper, we must get our spending and national debt under control. He has sponsored balanced budget amendments throughout his time in Congress, and will continue working to restore fiscal sanity in Washington. Prior to public service, Tim built a successful small business of his own. He was first elected to Charleston County Council, to the South Carolina State House, and the U.S. House of Representatives. In January 2013, Tim was sworn in as a United States Senator from South Carolina, and was re-elected in January 2017. Theodore R. Johnson is a senior fellow at the Brennan Center for Justice. 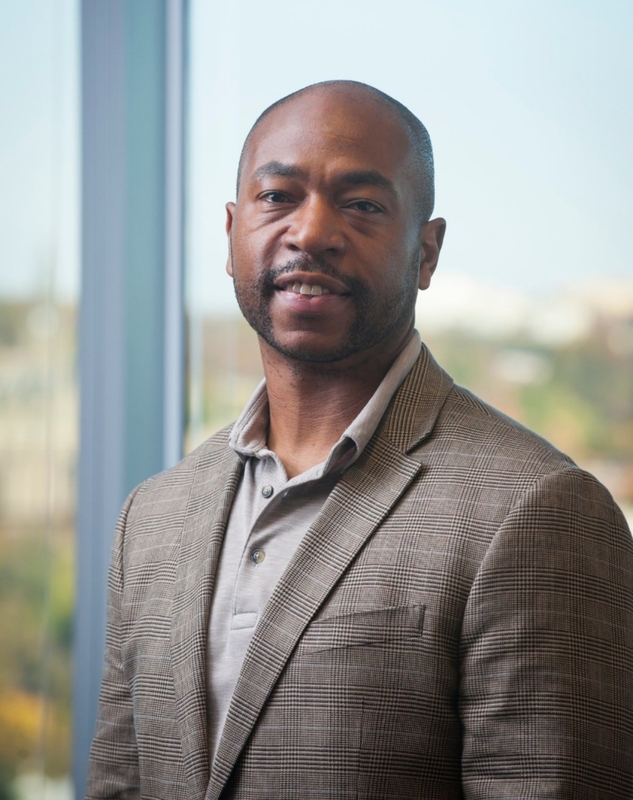 Prior to joining the Brennan Center, Dr. Johnson was a national fellow at the New America Foundation, where he undertook projects on black voting behavior and the role of national solidarity in addressing racial inequality. Previously, he was a Commander in the United States Navy and, most recently, a research manager at Deloitte. From 1994-2016 Johnson was a career military officer whose service included humanitarian assistance operations in Southeast Asia, as a military professor at the US Naval War College, and as a cyber operations and intelligence expert. He also acted as senior policy advisor in the Departments of Defense and Energy, and as speechwriter to the Chairman of the Joint Chiefs of Staff. In recognition of his leadership in public service, Johnson was selected as a White House Fellow during the Obama administration. Dr. Johnson holds a B.S. in mathematics from Hampton University, an A.L.M. with a concentration in International Relations from Harvard University, and a Doctorate of Law and Policy from Northeastern University. The Roma, the largest minority group in Europe, suffer from much institutional discrimination, including in the area of education. Nandini Kochar is an NYU Abu Dhabi film student currently studying at NYU Prague, and at the beginning of the semester she approached NYU Prague staff asking how she could meet or work with Roma, as she wanted to focus her film on this community. Yveta Kenety is the Assistant Director of Student Life at NYU Prague and used to work for the nonprofit ROMEA running a mentorship program for Roma high school students. 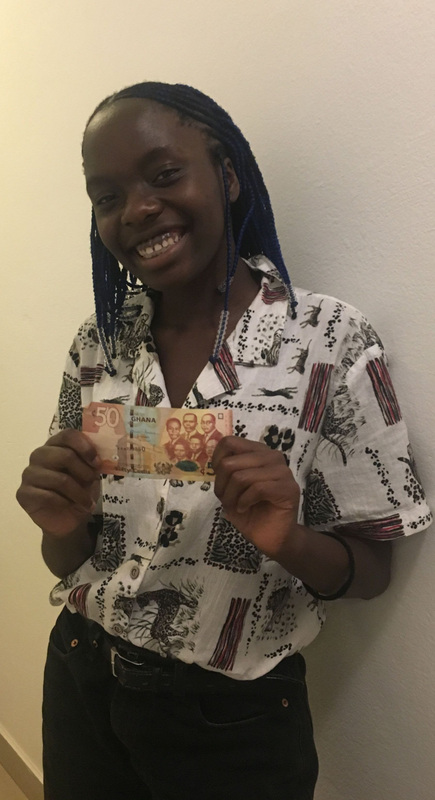 Yveta arranged for Nandini to do a non-credit internship there; read about her experiences meeting Roma youth for the first time. 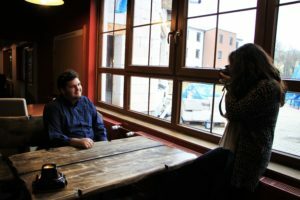 I have the pleasure of interning at ROMEA, a non-profit organization that advocates for the rights of the Czech Republic’s marginalized Roma population. As part of the internship, my friend Vitoria and I were given the opportunity to visit the small town of Rumburk and spend the weekend with Romani high school students. What started off as an educational trip focusing on interviews and photojournalism quickly transcended into a thought-provoking and humbling experience where our preconceived notions about the Romani people were fundamentally challenged and dispelled. We went from viewing the Romani students as victims of discrimination to everyday-teenagers with dreams and experiences no different from ours. Rumburk is situated in northern Bohemia (Czech Republic) with a population of around 11,000 people. ROMEA chose this town as the site for the eighth meeting of their BARUVAS program – meaning “We Are Growing” in the Romani language – that is offered as part of their Romani Scholarship Program. The program focuses on educating Romani students about their shared history and culture, as well as imparting relevant skills to them through workshops and seminars on media representation, networking, theatre, etc. As Vitoria and I spoke with more Romani students, what struck me the most was not the extent of discrimination they had faced on the basis of their ethnic identity but rather their resilience in refusing to let those experiences define them. They didn’t want to be seen as victims. Because they are not. It was at that moment that I became acutely aware of my own biases – I was so influenced by media’s one-sided depiction of the Roma and their marginalization that I had failed to see them beyond their social standing. But our personal interaction with them had quickly destabilized and shattered that reductive image. Vitoria shares the moment when this realization dawned upon her, “When we walked into the room and realized that this looks like a regular NYU Abu Dhabi class, it was a moment of wow, they’re wearing clothes I could never put together– their makeup is on point and their swagger level is amazingly high.” Indeed, they were just normal high school kids going through the typical teenage phase of being ‘too cool’. On a more serious note, Vitoria and I – both being women of colour – found resonance with the Romani students’ experiences of identity struggle and feeling of otherness. And by the end of the weekend, our relationship with them had shifted from interviewer-interviewee to friends. So much so that we were invited to their farewell party and were able to witness the ‘gypsy dance,’ as they call it, and jam with them to Romani folk songs. I will forever be grateful for my weekend in Rumburk because it saved me from falling into the pitfall of a single story of the Romani people. There are multiple stories and experiences and people existing within that one dominant narrative. And once we realize this, we begin to see that our similarities outweigh our differences, and we share so much more than we think. 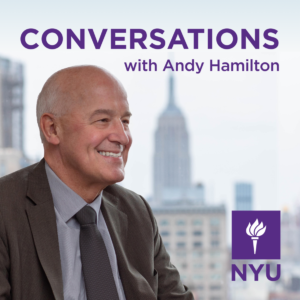 In this new podcast, President Andy Hamilton interviews NYU faculty, students, and alumni who are using their intellectual gifts, determination, and creativity to make a profound difference in our world. With each guest, he pulls back the curtain to learn the origins of their inspiration, the current focus of their work, and their vision for the future. His first guest is Rubén Blades(Fear The Walking Dead)— Steinhardt’s scholar in residence.